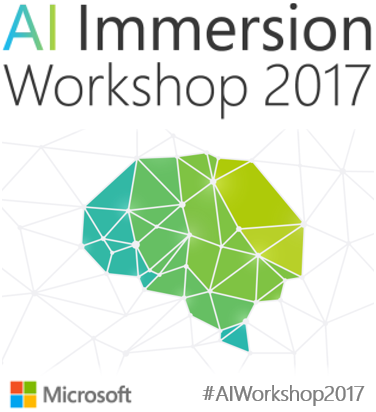 We are excited to announce that registration for the Microsoft AI Immersion Workshop is now open to all developers. The Workshop is being held on Tuesday, May 9th, at the W Hotel in Seattle. This is a free in-person event, but capacity is limited – so register now to reserve your spot. This is a unique opportunity for developers interested in creating the next generation of intelligent apps, including enterprise-grade solutions, using the very latest AI and Machine Learning techniques. You’ll learn how to build solutions from scratch. Seasoned software engineers and data scientists from Microsoft – people who are building some of the world’s most advanced AI and ML technologies – will run these hands-on tutorials. Several presenters are also active contributors to this blog, as you’ll see from the presenter names next to the session abstracts below. The Workshop will kick off with a keynote talk that will cover the breadth and depth of Microsoft’s AI investments and offerings. That will be followed by your choice of five deep technical tutorial sessions, which will run for much of the day, from 11:00 AM through 5:00 PM. These tutorials will focus on hands-on activities and projects, so attendees are expected to bring their own laptops, and also check our event website for any pre-requisite software or subscriptions they might need, to make the most of the day. BLOG: Free AI Immersion Workshop on May 9th in Seattle – Register Now!